Have you had a chance to read through this blog - because it is just full of inspiration! You can sign up for the newsletter to this blog (on the right hand side) and that way - all the updates come right to you! Today's project is a little birthday present that I created for one of my dear friends who is a writer. I wanted to give her something that she could keep on her desk that could hold some office supplies like paper clips, thumb tacks, etc. 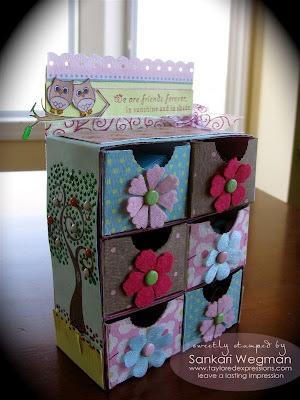 I love the papers from the Key Ingredients and I adore Taylor's newest stamp set Branching Out and used both of these to create this little mini chest with drawers. In each of the drawers I put a little special something in it and one of my favorite things in creating this project was to create a little special drawer for a secret stash of chocolate :) YUM! 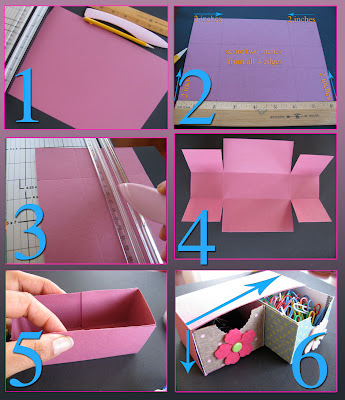 It was really simple to make this project - it goes very quickly because the boxes are super simple and easy to make. 4. If you don't have a Scor Pal - you can use a Paper cutter - just place where it needs to be scored and use your scorer along the path of the blade. 8. Your 2 x 2 inch card is ready to be decorated and filled!!! 2. I cut the cardstock to 8 3/16th by 5 1/2 inches and then scored at 2 inches from the edges. 6. Your rectangular box (4 3/16 x 2 inches) is now ready to hold two little drawers!! Then all you have to do is to adhere and create levels to your mini chest by stacking them up. I created three levels. And then decorate as you like. This project was really simple - because all the papers in the Key Ingredients kit coordinates and it comes with built in accessories such as the felt flowers, brads and matching ribbon. Everything is already ready at your fingertips! Since this is a gift for one of my dear friends - I used this beautiful sentiment: We are friends forever in sunshine and shade! Isn't that sentiment just the sweetest! It was fun to stamp the tree from the Branching Out set on either side and decorating them with the emerald liquid pearls for leaves and brads for flowers (an idea that was inspired by Donna Baker). I stamped and cut out the tree branch from this set and also two little cutie owls from the Branching Out coordinate set and then tired a little bow from this sheer ribbon. On the front of each of the drawers, I attached these super cute felt flowers with these cute glittery brads - all of which come together as part of the Key Ingredients kit. This was such a fun project and a quick one too - and once everything was folded and stacked - it was so much fun to decorate and fill it up! I still love that one drawer with a secret chocolate stash! Thanks so much for visiting! Fantastic girl! 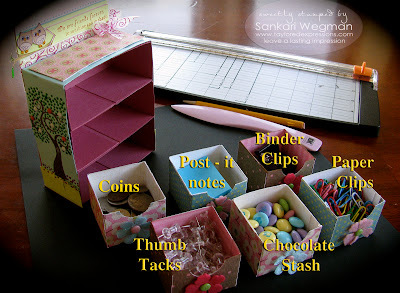 You make it look easy...love the idea...will have to try this soon! 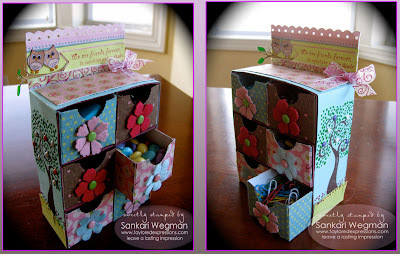 Love these boxes....like the flowers on the drawers. I'm sure your friend will love it!! Have added you to my fav. places to visit....great tutorial. This is AWESOME, Sankari! WOW! What a great project, girl! This is such an AWESOME creation!!!! Great work and thanks for sharing!! WHOA! this is so super sweet! I bet your friend will ADORE it-lucky gal! thanks for the step by step, sure will have to make one some day. Oh my word, this is amazing! And what a super tutorial too! Thanks Sankari! I love your bookcase.. and the way you decorated it! Your friend will love it! How fun is this!!! 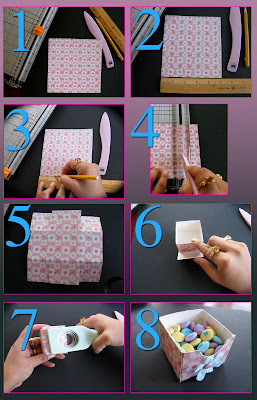 I so need to make one for my daughter toput on her desk in her room :) Sooo cute!!! Amazing, Sankari! What a great idea, and so perfectly executed!! You're amazing!! Sankari, my Sankari. You are... ahhh-mazing! OK we definitely have to meet up half way. So what's between Cal and Io? Calio? I'm not making sense today (1-1/2 hrs sleep). Lurve you. Awesome project! Love what you did... great colors and embellishments. TFS! OMG!! I just shared the link to this way awesome, cool, unique, fantasticly super project!! I am printing the directions now, and then I am off to create!! It's amazing to me the brilliantly, clever things one can find online and for FREE!! You guys are awesome. I will be back. Thanks for sharing such wonderful creations!! Hello, Super project you made! I copied and hope that you find good dutch sizes that I've put on my blog. I have your blog put it in so that everyone knows that it comes from you. this is amazing , Very great idea, and so perfectly. That is adorable! I absolutely love miniature boxes! You've packed double triple + 1 the cuteness factor all in this project!